Having a wider scope doesn’t imply having more power. A great deal of political power is concentrated at national level in the Western world, whereas multinational and global governance is much less robust. 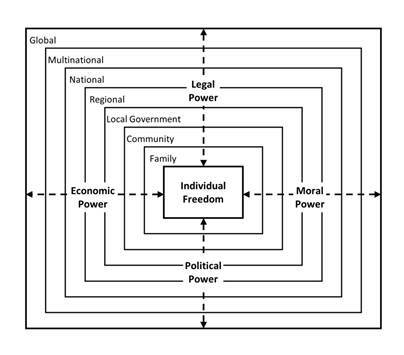 Whereas domains of legal and political power mostly have geographical boundaries, economic power and moral influence traverse political boundaries. An individual person’s influence, upon those who have been granted power, is proportionally less in the larger domains of control. Different types of power are exercised in domains whose boundaries may overlap or be diffuse (2.8.1). Not all power flows down through a hierarchy; some forms of authority are empowered by agreement from below. Power can flow upwards or downwards, or be pooled (2.8.2). There are limits on the degree of authority that can be exercised in any domain (2.8.3). The arguments for and against centralisation are briefly examined (2.8.4). A detailed example, of law enforcement, illustrates how subsidiarity works in practice (2.8.5).